Northern California’s Middle Fork American River (MFAR) offers a great many options to visitors looking for a more remote and isolated white water rafting adventure. This Class IV river trip covers 16 miles of the Middle Fork of the American River and is offered as our Ruck-A-Chuck California Rafting Trip. First, for a early morning start, we kick things off with a Class III rapid just yards from the put-in. Then, we run a few more rapids to get us warmed up to rafting. Next, we hit some more challenging and visually impressive rapids including Tunnel Chute Rapid, a narrow rocky chute. After a number of large rapids we get a bit of a break as we float down intermittent class II rapids for the next 9 miles, rest, have lunch, and get to know each other better. In the afternoon, after a time of relaxation, we’ll jump back in to some more Class IV rapids in quick succession be before calling it a day and heading back home. Middle Fork American river rafting is best for those that have recent rafting experience, or adventurous first timers. 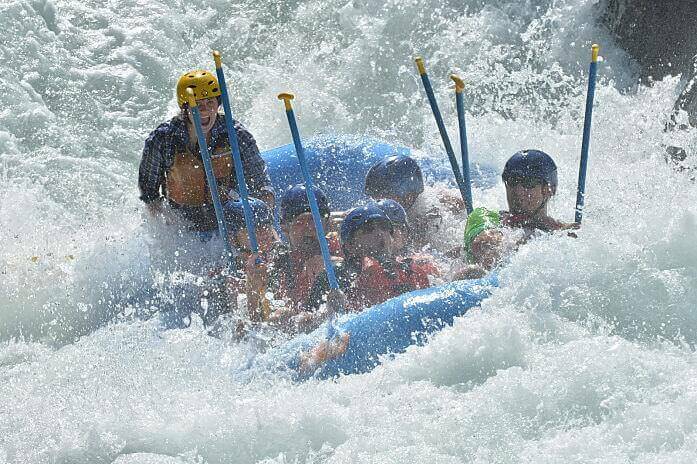 This whitewater rafting trip is a full one day rafting experience. There is a Class II run on the lower section of the Middle Fork of the American River. But due to the extended travel time and equipment logistics we do not typically offer rafting trips on this scenic section. Rock-N-Water is a group of Christians who want to impact youth with the joy of God’s Living Word through rafting adventures. We focuses on providing high quality rafting trips for youth, families, churches, and schools. In conclusion, please contact us if you have any questions, or are not finding your perfect american river rafting trip. We would love to help you combine our one day adventures into a great trip, or help you customize the perfect day trip. Note: While there is a Class V rafting section on the North Fork American River, with our primary focus on youth, and that section only being runnable during the springtime (when students are still in school) we do not provide rafting trips on that section – please contact us if you would like to raft that section. We’d love to give you our recommendations on rafting companies you might consider.